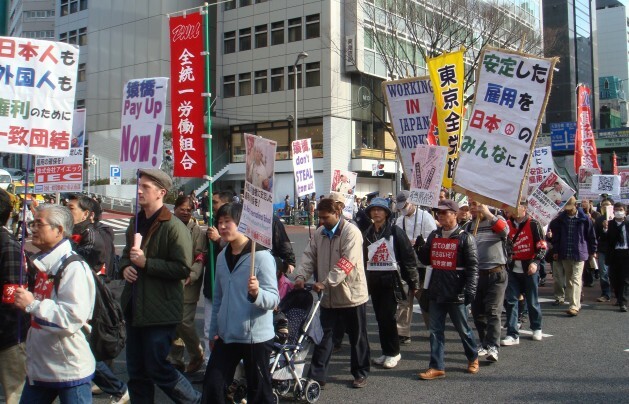 Foreign workers rallying in Tokyo against discrimination and denial of basic rights. Credit: Catherine Makino/IPS. TOKYO, Apr 23 2014 (IPS) - Desperate for more workers to support a construction boom, Japan has proposed to expand its controversial foreign trainee programme to permit more unskilled labour from Asia to work in Japanese companies for five years from the current three years. The internship plan launched in 1993 invites foreign trainees to work in Japanese companies under the slogan of learning new technologies before returning home. But it is ridden with problems. "The new move is a clear example of a ‘use and discard foreign labour’ goal." More than 200 companies were reported in 2012 for abuses such as low pay and long working hours for foreign workers. Activists view the trainee system as a blatant stop-gap measure to counter Japan’s aging population – a quarter of its 130 million people are above 65. From a peak of 83 million workers in 1995, their number had fallen by almost five million in 2012. The construction industry badly needs foreigners for jobs such as plasterers and mold makers. The government has now proposed a plan for trainees to extend their visas by two years for “designated activities” to pave the way for employment for trainees. Labour activists say the move is suspiciously timed for Japan to host Olympics 2020, and that it will do little for the stated policy of the trainee system to exchange technology with developing countries. “Japan’s immigration policy refuses to treat migrant workers as people with rights that must be protected. The new move is a clear example of a ‘use and discard foreign labour’ goal,” Ippei Torii, head of the foreign workers branch at Zentotsu, a leading labour organisation, tells IPS. Zentotsu has taken up negotiations on behalf of several foreign trainees who have been discriminated against by their employees. A typical example is the ongoing cases of six Chinese women who were paid four dollars an hour, half of the official minimum wage, for three years at a sewing factory in rural Japan. “They could not escape because each was saddled with 8,000 dollars in debt they had incurred in their home towns in China to brokers,” says Ippei. Currently 19 percent – or 136,603 – of all foreign workers in Japan are trainees. Nationals from China, Vietnam and the Philippines top the list. About 15,000 of the foreigners are employed in construction. Their average wage is around 1,200 dollars per month, plus payment for overtime work. Following a clampdown, the number of foreigners overstaying has dropped to about 6,000, from a high of 250,000 recorded in the nineties. “Because of the crackdown, poor people from Asia are now entering Japan as trainees or extending their stay by applying for refugee status, or marrying local people in a desperate bid to live here,” Kato tells IPS. The Construction Workers Union is opposed to the new trainee plan on the basis that it would increase the number of low-paid foreigners, posing a risk to the higher salaries of Japanese workers. The Japan Federation of Construction issued a statement last week calling for doubling the number of female workers from the current 90,000 over the next five years to bridge the gap between supply and demand. In a Yomuiri newspaper public opinion survey in March, only 10 percent of those polled were ready to accept unskilled migrant workers, because of concerns such as crime. An overwhelming 85 percent supported more women in the workforce as a solution. Japan has an embarrassingly low acceptance of foreigners – less than two percent of the Japanese population. This includes almost 400,000 people under the Special Permanent Residents category reserved for people of Korean descent who were born in Japan but have not become citizens. With only 1.1 percent of its workforce comprising foreigners, Japan is at the bottom of the list among industrialised countries. Germany comparatively has 9.4 percent and the United Kingdom 7.6 percent. Even South Korea, facing a workers crunch, showed higher figures at 2.2 percent in 2011, the result of offers of a three-year working permit for foreign labour. In the face of the looming demographic crisis, Japan too has had to make some changes in its immigration policies. Two Economic Partnership Agreements were signed with Indonesia and the Philippines in 2008 that included a provision for nurses and caregivers from those countries to work in Japan. About 750 nurses have arrived in the past five years. Japan’s nursing industry is grappling with a shortfall of 43,000 nurses, according to the Health and Welfare Ministry. Many Japanese nurses quit after starting a family because they are unable to cope with the long working hours in hospitals. Japan introduced a policy in 1990 to permit Latin Americans of Japanese descent to work as temporary migrant labourers. More than 220,000 arrived, mostly from Brazil. These Nikkeijin as they are called are descendants of Japanese who had emigrated to Latin America in the 1920s. The Nikkeijin policy changed soon after the 2008 global financial crisis, when the government took the unprecedented measure of offering free transport to Japanese Brazilians who opted to return to Brazil. Indonesian and Filipino caregivers who study and work in Japan have struggled with passing tests to continue nursing in Japan. Of the first 104 Indonesians candidates, just 24 passed in 2011. Others are still studying. It would make more sense for Japan’s construction industry to develop construction technologies that are less labor-intensive. The Chinese Broad Group has pioneered such technology with their pre-fabricated high rise towers. Construction is one industry that seems ripe for technological innovation. Japan is a disgusting country. They only think about themselves and do little to help and give opportunities to others. I really wish Japan the worst of luck. I honestly have no respect for these people.